Do you always go to the same beach when you´re on vacation? This year change your routine and discover some of the most beautiful beaches on Krk Island. Some of them are well hidden, and some are just in front of your eyes! Krk Island is well known for the crystal clear sea that surrounds it. This reputation is justified by the fact that Krk Island is also called "The Island of blue flags". The Blue flag is a world-renowned eco-label trusted by millions around the globe, which guarantees the sea cleanliness and the quality of services offered on the beaches. There are 37 blue flags on Kvarner region, of which 15 are on the Krk Island. The town of Krk also has many various types of beaches, for everyone´s wishes and needs, and most of them earned the blue flag. The most visited are Ježevac, Porporella and Dražica beach. These beaches are well equipped with showers, deck chairs and parasols. Porporella and Ježevac are beautiful pebble beaches which are located in the western part of the town, while Dražica beach, rocky-pebble beach with plateaus, is situated east of the town center just below of our Dražica Hotel Resort. Near Dražica beach you can find bars and restaurants, children´s playgrounds, as well as tennis and beach volleyball courts and newly opened outdoor exercise ground „Krk Street Workout Park“. For those who prefer to relax on the beach, we recommend a massage or a natural Fish pedicure treatment. Although there are many beautiful beaches on the island, here is our top 5 beaches you should definitely visit during your vacation on the Krk Island. Vela Luka is one of the most beautiful bays on the Krk Island. It is approximately 1.8 km long and 400 m wide. It is well known for its beautifull sandy beach, which has even a spring of drinking water. You can reach the bay only by boat or by 6 km long hiking trails. Although it may seem like a long way to go, once you reach the Vela Luka bay, you will find that all efforts have paid off. There is a restaurant at the beach where you can find refreshment, relax on deckchair or lounger . And if you got there by foot, you can also order a taxi boat to take you back to Baška. Vela Plaža beach is situated in the center of Baška and is surrounded by restaurants, pizzerias and bars. The sea is turquoise blue, it is quite shallow and since it has sandy bottom, this beach is perfect for children playing in the shallows. However, you should be cautious because of the big waves that are very common there. 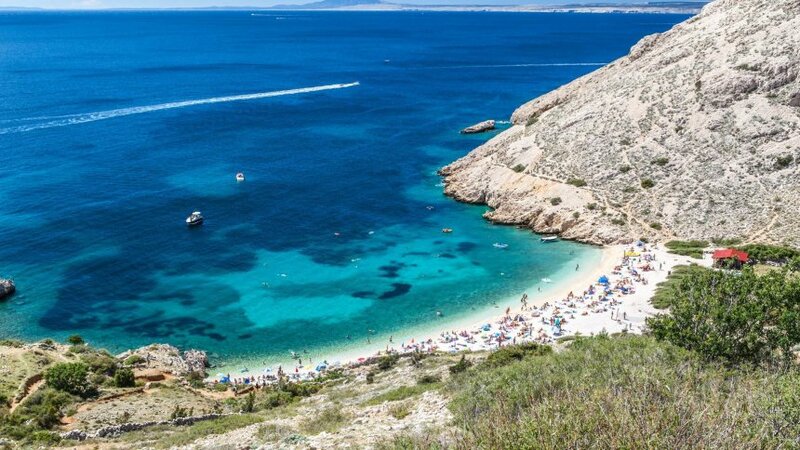 It is important to mention that Vela Plaža beach is one of the most beautiful beaches on the Adriatic and that it is the main reason for the development of tourism in Baška. During summer, especially during peak season, the beach is quite crowded and it is almost impossible to find a place to lay down your towel. Even if you are not a person who likes crowded places, visit the beach at least once during your stay and experience its charms. Oprna Beach is very beautiful, but at the same time one of the most inaccessible beaches of the island of Krk. It is situated in a beautiful bay, right in front of Stara Baška. One way to get to the beach is by narrow and quite uneven trails. But trust us, it is worth the effort! When you see that crystal clear sea, you won´t regret taking that trip. Not for a second! There is also another way to get to the beach - by boat. You can take an boat excursion from the town of Krk, since there are many boats that included this particular beach in their route. But you can also take a taxi boat to the beach. Many of you have already heard of Vrbnik, known for its beautiful valley and some for its well known product – golden wine Vrbnička Žlahtina. Vrbnik is one of the oldest settlements on the Krk Island, situated on a cliff which steeply rises 50 meters above the sea. Besides beautiful nature and old narrow streets, Vrbnik hides many wild and accessible beaches not known by many people. For that reason these beaches are perfect for those who want to escape from civilisation and crowds. In the vicinity of Vrbnik you can find the Nuluk, Pod Kovač and Kozica Beach and a little bit further there is Potovošće Beach. This beautiful pebble beach is situated arround 2 km south of Vrbnik and is reachable by boat or trough pine forrest. The sea is crystal clear and the bay has a beautiful view on the hills nearby and its coast. The beach doesn´t have natural shade, but in peak season there is a small bar which offers refreshments and parasols. This remote beach is situated near a small settlement called Risika in the vicinity of Vrbnik. This beautiful and natural sandy beach has a lovely meadow with a couple of smaller trees – perfect for escaping from the hot sun. We invite you to visit Krk and stay with us in Hotels Krk! If you want to stay near the beach and pine forest, we recommend our Dražica Hotel Resort which is comprised of 3 accommodation centres: Hotel Dražica, Villa Lovorka and Villa Tamaris, and has two outdoor pools and a waterslide. If you prefer more intimate and luxurious accommodation known for its high quality services, we can recommend our most exclusive hotel – Marina Boutique Hotel.